I too think that it has gotten a bit too complicated. I would not understand without a good explanation how to interpret the loading bars you show in the last post, and I think that that would make the loading bar redundant, since it anyway can't show very detailed info due to its relatively small size and lack of text (color explanations) and it would just be much easier and much more precise to just look in the cargo manifest directly. I believe we need to agree on what information the loading bar actually should show us, as I believe one single bar cannot show us everything. I agree with Vladki that more bars increases precision, however I'm unsure how it should work with lots of classes and lots of cargo categories. As those are predetermined only by the pakset the window need to be able to cope with multitude of bars, not to forget some way of clarifying which bar goes to which category. And there is the issue with the overcrowding capacity that is not tied to the specific classes, so there would somehow have to be a completely separate "overcrowded bar" to accommodate for that. As to the yellow wait for load, I still think it can be scrapped, due to my earlier reasons. The issue with the other windows, I believe it could be worthwhile to have the "speed text" in those windows as well (that would be the text that for instance shows the speed when the convoy is driving, and "wait for load" etc..). I think in general that would be useful information for those windows. I think the loading bar(s) should be kept simple. It's after all duplicating the information from the cargo manifest, so it doesn't need to be very detailed. I liked the split between passengers and the rest of the cargo, so the passenger bar could have its own layout with the separate small overcrowding bar. The colors of the bars would be green for loaded cargo and passengers, purple for overcrowded passengers and just dark grey for empty space. No yellow wait for load and no changing of color based on cargo or full classes, that would only get confusing. Instead, I liked the icons to show up on different occasions, for instance when a class is full or when a cargo category is full. Again, the detailed information is already present in the cargo manifest, so the loading bar(s) with associated icons should only be for quick overview to check that things are running ok.
Ves, overcrowding is class sensitive too. Are you sure one can specify overcrowded capacity per class in the datfile? As I recall it you only specify overcrowded capacity for the whole vehicle across all classes? I had to get the overcrowding number of all classes when I made the overcrowding bar patch. For example, when a medium class vehicle has 10 overcrowded capacity, the passengers standing on that car are counted as medium class overcrowding. 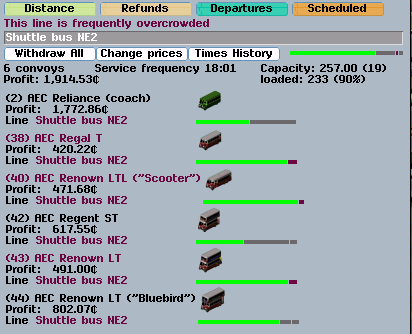 I do not know what will happen if a vehicle that has multiple classes has overcrowded capacity. Please refer to simvehicle.h for overcrowding being tied to the class. I suggested what I did for the first two green and purple because, as pointed out by Ves, I knew that problems would arise for goods color. I think that it makes sense to divide categories into three colors. It is better than green one color. 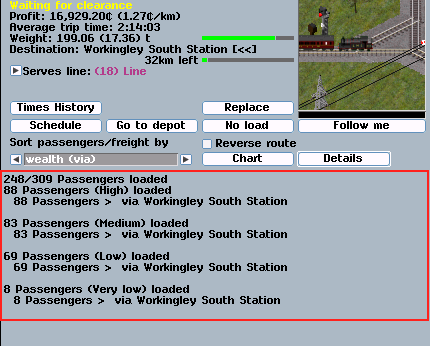 For example, you can easily distinguish between freight train and passenger train. And since the width of the bar is at least 100px, 1% can be identified. 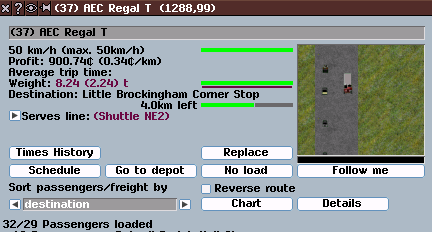 In convoy information dialog you can delegate the display of wait for loading to text, as Ves says. However, I do not like this yellow letter because it is a bit hard to read. I do not like to contain much information to the bar. 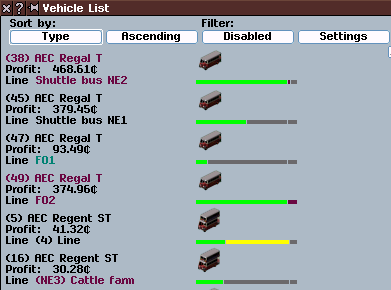 I think that detailed information should be borne by the part surrounded by red part or convoy detail window. Although it is out of the main subject, as for goods, I think the what information really needed is which category's capacity the convoy has. My apologies for not having had time to look into this again until now. I do agree with Ves that this overcrowding indication needs to be clearer to somebody who has not read a detailed description of what the bar is intended to do. 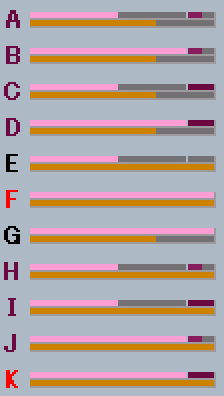 I do like the suggestion in the last post made with the composite image of having separate categories indicated with symbols clearly. I wonder whether we might actually have one bar per symbol laid out vertically, or else I fear that trying to fit all that information into one bar will make it too confusing and hard to read. Most vehicles would only have one or two categories, so this would not unduly affect the layout of the window. Is that a realistically possible solution?